The Sniper 2R is a new multi-effect lighting fixture and ‘laser simulator’ that gives mobile DJs a new tool with which to get creative and expand their light shows. This exciting new fixture is essentially a hybrid of beam, scanner and laser effects; emitting a powerful, narrow three-degree beam, and utilizing a high-speed X/Y scan and Z rotation mirror system to project laser-like effects into the crowd, without having to worry about laser safety regulations. The Sniper 2R’s effects include liquid sky, laser wave, and laser cone effects – all of which move at never-before-seen speeds. Such effects and speed have been enabled by recent advancements in lamp, electronics, optics and motor technology; the Sniper 2R is powered by the new 132W Philips MSD Platinum Lamp (with a 6,000 hour lifetime rating) that delivers high-intensity beams of white light. Mobile DJs then have a choice of fourteen dichroic colours and seventeen static gobos (including GOBOs for beam reduction), allowing them to create dynamic effects that move fast due to the quick-moving mirror system – ideal for the evening reception at a wedding or the energetic environment of a school disco. 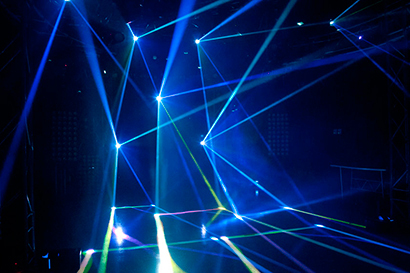 A three-facet rotating prism lets the user create multi-beam effects, while strobing lets them intensify the lightshow further. What’s more, the Sniper 2R consumes a maximum of just 205-watts of power, so multiple fixtures can easily be incorporated into a mobile show running from a standard 240V 13A wall socket. The Sniper 2R is DMX-controllable, offering the user access to 14, 16 and 18-channel modes and allowing in-depth programming, for a more impressive lightshow. With professional-grade Neutrik 5-pin DMX in/out and Powercon in/out connections, mobile DJs can easily link together multiple units for a more extensive setup. Weighing in at a modest 9.5Kgs, mobile DJs will have no problem taking the fixture on the road with them as part of their everyday gig setup. The Sniper 2R has already had its first televised event, having been used on the Big Knockout Boxing show for DirecTV in Las Vegas back in August. It has also made its touring debut on rock band A Day to Remember’s US Tour.